After a very disjointed practice session that was stopped by a stalled Marco Andretti, an extended track inspection and another smattering of raindrops – Practice One for the Bommarito Automotive Group 500 was drawn to a merciful close. Will Power turned the most laps with thirty-nine. My theory that Chevy may repeat their dominance from a year ago at this track may prove flimsy. 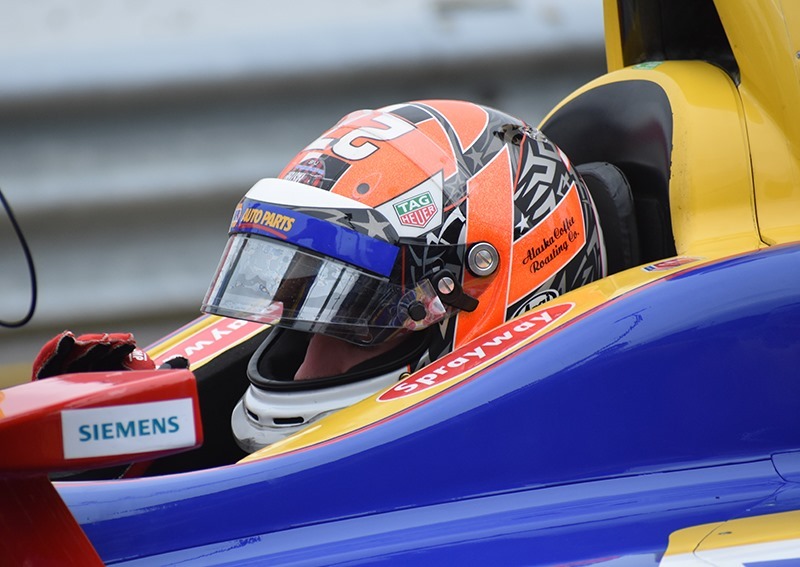 The Top-Three cars were Honda-powered, with Alexander Rossi pacing the field with a lap of 184.424 mph. Scott Dixon was second quick with a much slower lap of 182.773 mph. Sébastien Bourdais was just a tick slower than Dixon with a speed of 182.675 mph. My pick to win, Tony Kanaan, was fourth quick and the fastest Chevy with a speed of 182.444 mph. Ed Jones rounded out the Top-Five. The only other Chevys in the Top-Ten were piloted by Spencer Pigot, who was seventh quick and Josef Newgarden, who was tenth. 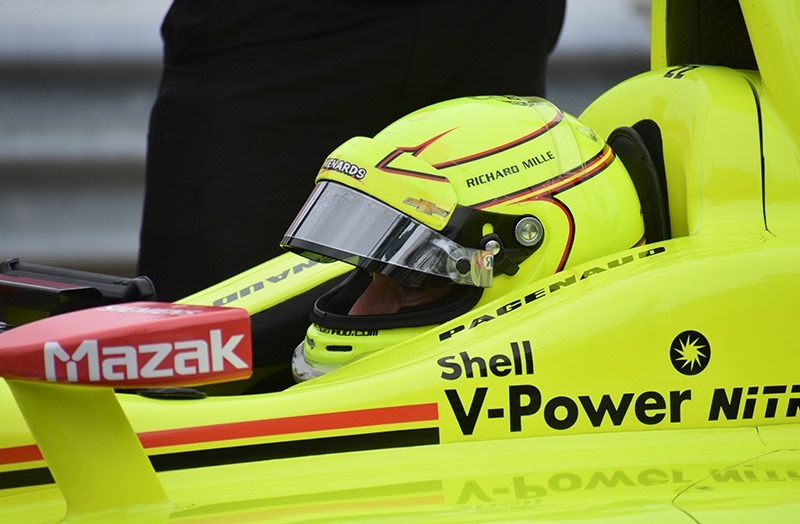 For the record, the Penske cars were tenth (Newgarden), eleventh (Power) and twelfth (Simon Pagenaud). 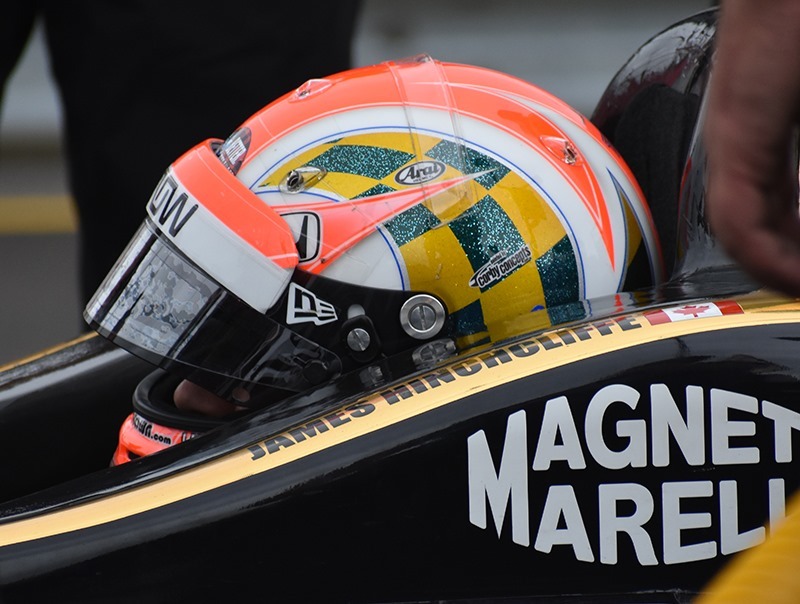 Susan was able to get some good photos of a few drivers sitting in their cars during the prolonged track inspection; Simon Pagenaud, James Hinchcliffe and Alexander Rossi. This was the view of the cars that most of us had in this afternoon’s shortened practice. The yellow flag flew at 4:38 when rain returned, albeit a very slight shower. There will be no qualifying. The starting grid will be set by entrant points, meaning Scott Dixon will start from the pole alongside Alexander Rossi. The final evening practice will begin at 7:30 and will run until 9:00 tonight, weather permitting. It’s cool here. 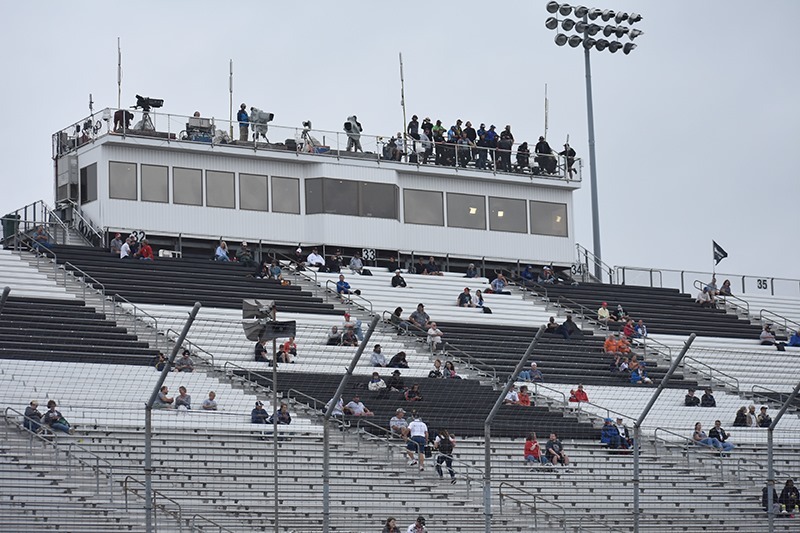 The temperature is around 70°, but with the clouds and a breeze – it was cool on pit row. I was wearing a light windbreaker and was glad I had it. With the inclement weather, the crowd is obviously down. In fact, I’d say it is practically non-existent. I can’t say that I blame them. But kudos to the few hearty souls that came out. I am looking forward to the extended night session. I love seeing the cars under the lights and the cool weather is going to be a new experience for this time of year. I am going to appreciate the cool temps while we’ve got them. Tomorrow is going to be vastly different. The weather app on my phone is now actually calling for a heat advisory on Saturday, which seems strange as we sit in cool temps on Friday night. The forecast is sunny, humid and hot; with a high of 93°. Whatever the drivers learn tonight may not apply at all tomorrow night. 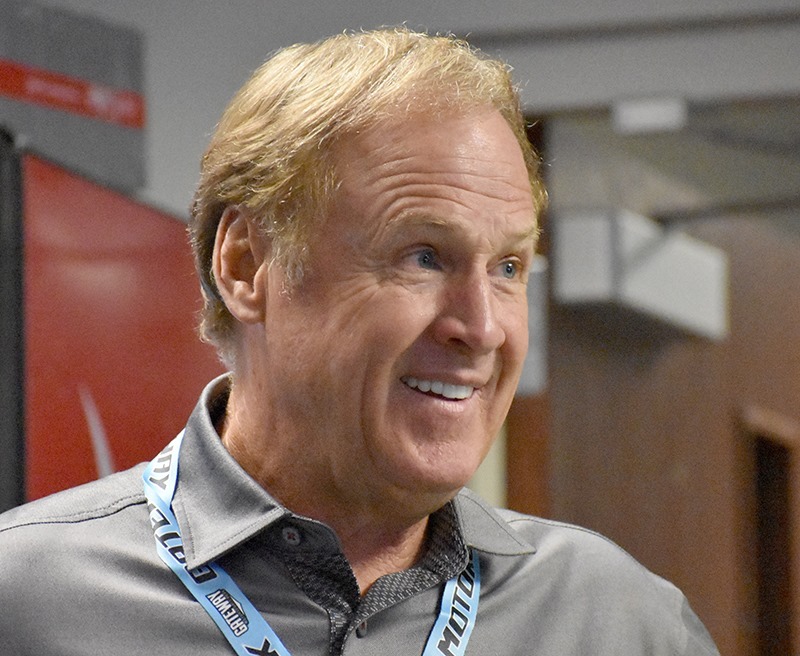 Former NASCAR champion and Missouri native Rusty Wallace is the Grand Marshall for the K&N Pro Race this weekend. He entered the Media Center around 5:00 and caused quite a stir. Susan was able to sneak a photo of him. 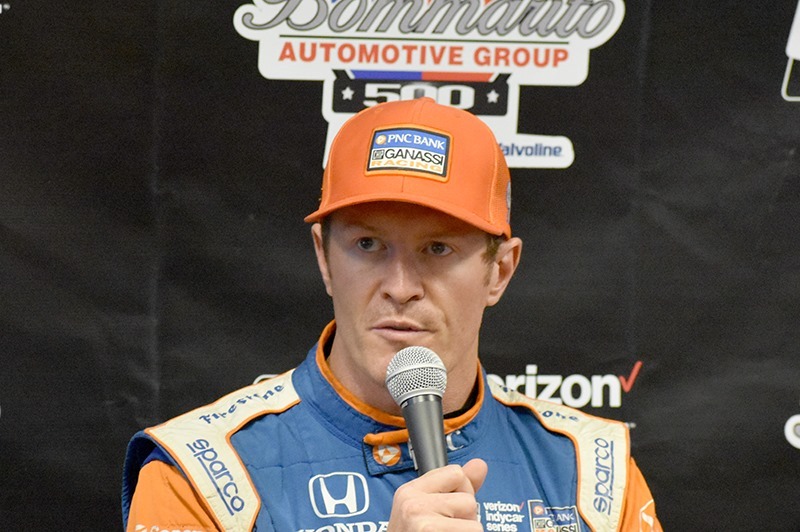 Scott Dixon and Josef Newgarden came in to address the media after it was announced that qualifying was cancelled. Dixon seemed to be OK with it even though he would not be awarded the point that usually goes to the pole winner. 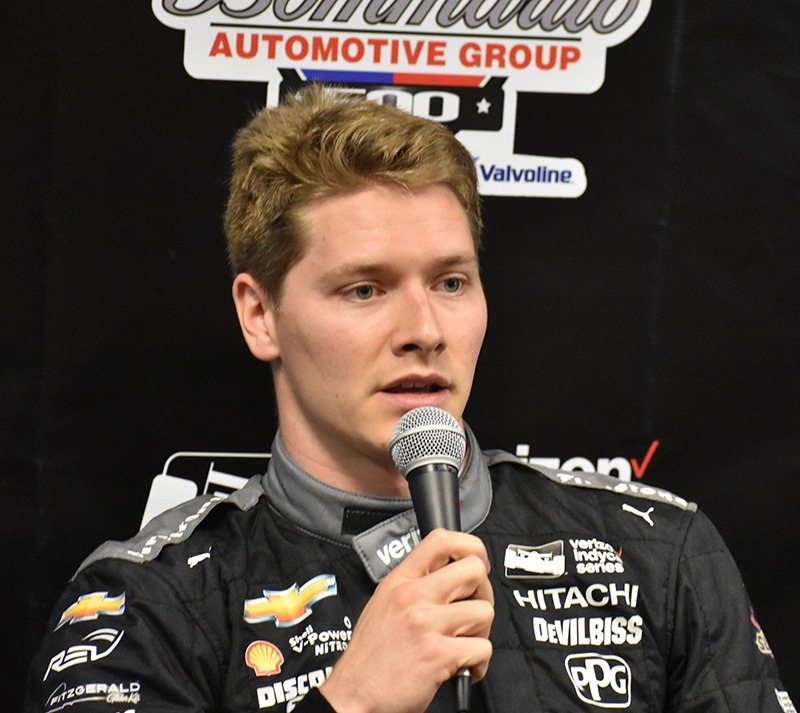 But Newgarden was disappointed that qualifying would not take place. Based on his tenth position in practice, I would think he would be happy starting third. As I finish this up, the Pro Mazda practice is taking place; and what do you know? The sun has come out. The weather looks good for tonight and the forecast sounds promising for tomorrow. Let’s keep our fingers crossed that we’ve seen the last of the rain. We drove through enough today to last for a week. I’ll be back tonight after the final practice for a quick wrap-up. Check back later tonight. In the meantime, for quick updates, photos and videos follow us both on Twitter. You can follow me at @Oilpressureblog and Susan at @MrsOilpressure. However, the cell reception is not great here. I noticed today that it takes a while to post on Twitter, so bear with us. Please check back later after tonight’s practice. This entry was posted on August 24, 2018 at 6:16 pm and is filed under IndyCar. You can follow any responses to this entry through the RSS 2.0 feed. You can leave a response, or trackback from your own site.